Building a battery out of common household products is actually pretty simple. All that is required is two dissimilar metals and some sort of electrolyte to facility the transfer of charge. A popular grade school science experiment demonstrates this fairly well by using copper and zinc plates set inside a potato or a lemon. Almost anything can be used as the charge transfer medium, as [dmitry] demonstrates by creating a rather macabre battery using his own blood. The battery was part of an art and science exhibition but it probably wouldn’t be sustainable on a large scale, as it took [dmitry] around 18 months to bank enough blood to make a useful battery. Blood contains a lot of electrolytes that make it perfect for this application though, and with the addition of the copper anode and aluminum cathode [dmitry] can power a small speaker which plays a sound-generating algorithm that frankly adds a very surreal element to the art installation. While we can’t recommend that you try to build one of these batteries on your own without proper medical supervision, the video of the art piece is worth checking out. We’ve seen a few other hacks that involve blood, but usually they are attempting to use it for its intended purpose rather than as an alternative energy source. This one would make a nice centerpiece for your Halloween party. It’s a battery with tiny pumpkins serving as the cells. [EM Daniels] shows us how to clear out the pumpkins, fill them with some freshly mixed electrolyte, and he even throws in the directions for baking the pumpkin seeds. 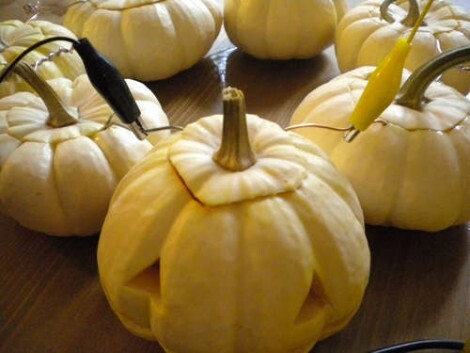 Each pumpkin will need a pair of conductors made of dissimilar metals to serve as the anode and cathode. Copper wire is used for one, aluminum for the other, and both wires have a spiral pattern bent on one end to increase the surface area that contacts the electrolytic solution. Now just boil up a slurry of vinegar, gelatin, and salt, then let it sit in the fridge over night. [EM Daniels] was able get 1.5V out of this project (enough to light one LED) for two hours, and 1.4V for six hours by using seven of the pumpkin cells in series.